The home search that follows shows current MLS listings (Active & Pending) of homes for sale in Ashbrook. If you have a question, or would like a NO PRESSURE APPOINTMENT to see homes in Ashbrook, call Jim at 512/913-1557. Neighborhood Location: Ashbrook is located in South Austin on the west at the end of South 1st St. where it intersects with FM-1626. The main entrance to Ashbrook is on Ashbrook Drive. Scroll down to view more info on Ashbrook. 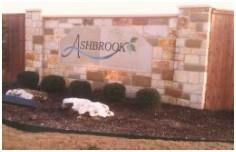 The development of Ashbrook was completed 2012. This neighborhood offers home buyers resale home purchase opportunities. Ashbrook real estate market stats are from the Austin Board of Realtors, 1/1/11 through 12/31/18. Centex Homes began the development of the Ashbrook subdivision in 2008. It was completed in 2012 with 175 single-family homes. The first home sales recorded in the Austin MLS system in Ashbrook were in 2009. The homes in Ashbrook include both 1-story and 2-story homes that range in size from 1,201 sq.ft. to over 2,100 sq. ft. The homes sold in 2016 ranged in price from $197k to $258k. The homes in Ashbrook were built with many standard features, both interior and exterior, that make them appealing to new home buyers. These include features to enhance energy efficiency (14 SEER A/C & heat pump system, R-13 wall and R-38 ceiling insulation, double pane Low-E sindows, e.g. ), satin nickel doorknobs, oak picture frame cabinets, Whirlpool appliances, etc. Students living in Ashbrook attend schools of the Austin Independent School District. It is always wise to check with AISD to confirm the current assigned schools for a subdivision. School districts sometimes redraw school attendance boundaries as areas develop.